Sunset and early evening are my favorite time of day in Italy. Rather than retreating home, it seems like everyone pours into the streets for strolling, shopping, or an aperitif with friends. Even public festivals and fairs continue on through these waning hours. 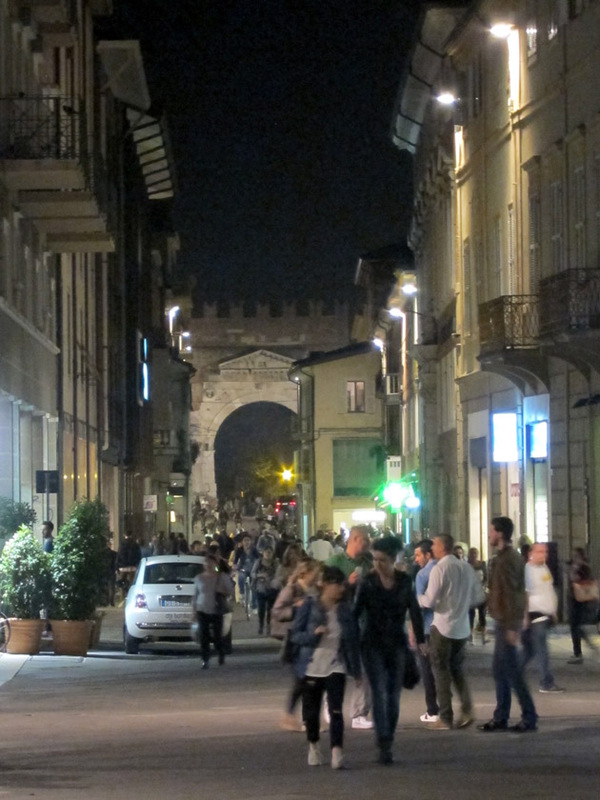 While my days in Rimini, Italy where busy with TBDI 2014, it was still a pleasure to enjoy the city with an early evening walk through its historic heart amid the vibrant nightlife. Rimini is on the northeast coast of Italy in the Emilia-Romagna region. 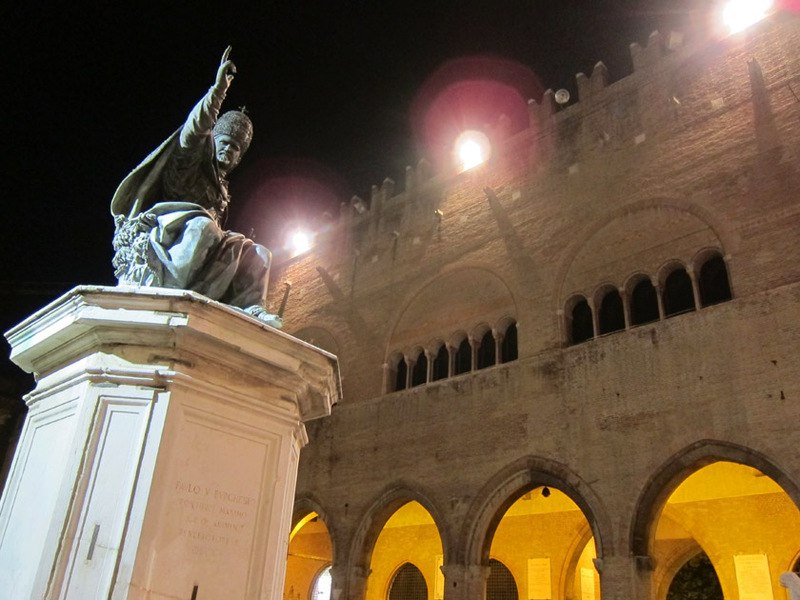 Rimini has been populated for centuries so you will find a variety of architecture there today. The modern city is improving its streets and squares to make the old downtown area more pedestrian friendly and to improve traffic flow. There are Google-like flags marking these area of urban enhancement. Plus, the streets are cheerfully decorated in matching yellow, red, purple and blue banners matching the civic pride. 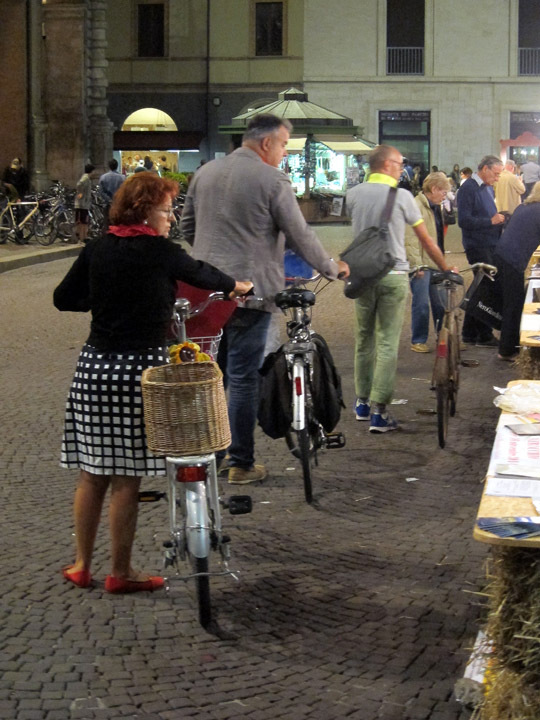 On this particular evening, there was an outdoor wine tasting event taking place with stations throughout the old city center along with live music, food stands, and craft vendors. 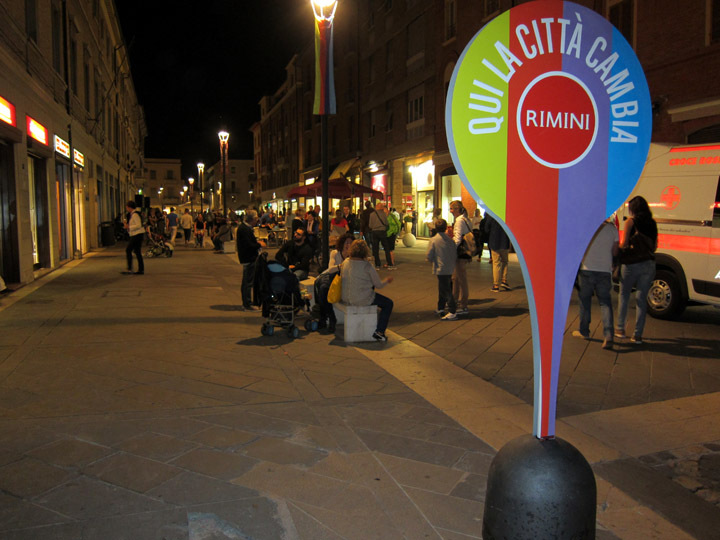 The Piazza Cavour is one of oldest squares in Rimini. The medieval center of government and business, it is ringed by several important structures. On one side is the Piazzo dell’Arengo which was built from 1204-1207 to house the city council and courts. This solid Romanesque Gothic building has a ground-level portico of pointed arches. The top edge is crowned with bold crenelations. 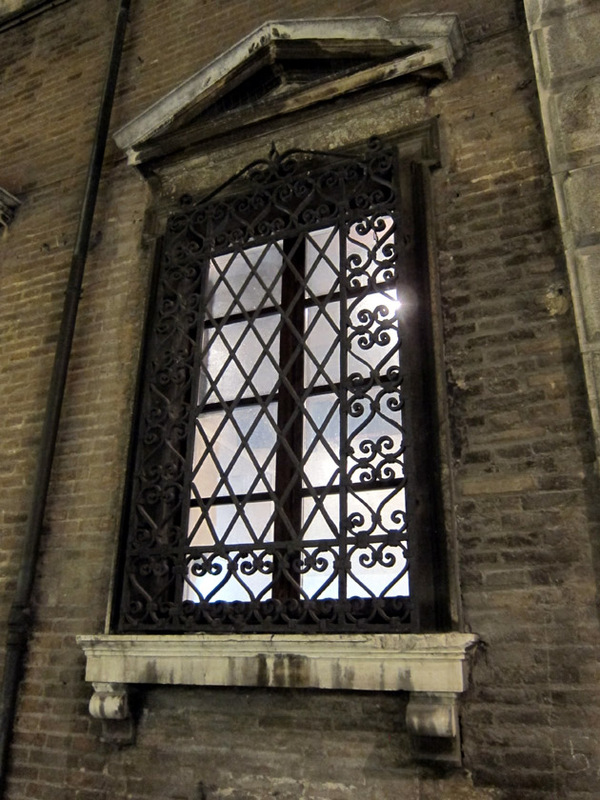 The adjoining Palazzo Podesta is from the same time period. The other side of the Piazza is lined with restaurants, shops, and the elegant Vecchia Pescheria (Old Fish Market) which was constructed in the 18th century and features white stone colonnades and marble benches. At the back of the square is the mid-19th century neoclassical Teatro Amintore Galli which was largely rebuilt in the last 10 years after excessive damage in World War II. I loved the Pigna Fountain near the middle of the piazza. Built during the Renaissance, the elegant curves of the base create individualized sections with alternating spouts for water. Beautiful and practical, I can imagine centuries of people stopping here to get a drink, to fetch water for a household, or to just socialize around this community focal point. The fountain remains a popular gathering place today. 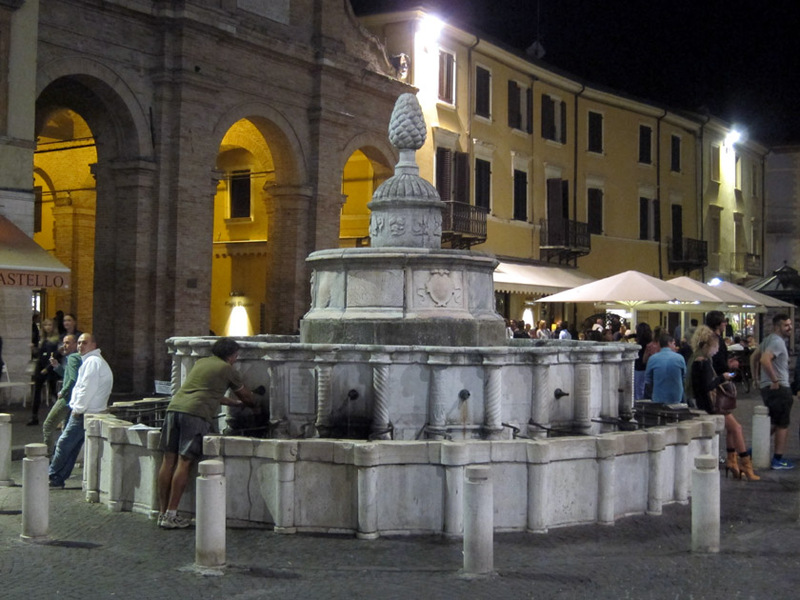 The Pigna Fountain from 1543 gets its name from the central pine cone decoration. On my particular stroll through Piazza Cavour, there was a small street market selling wine, cured hams, and other regional food items. I loved seeing the authentic local products and watching the casual shoppers peruse the booths. A few blocks away is the Tempio Malatestiano. Built like a shell over an earlier Gothic church, it is an interesting example of Renaissance architecture. 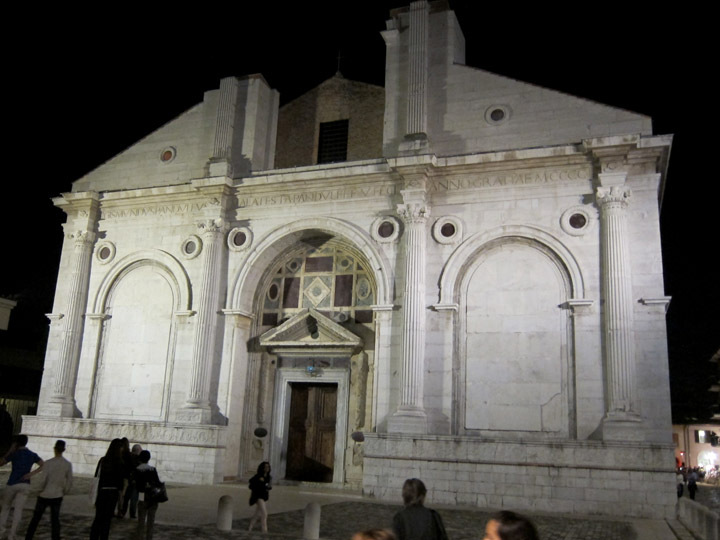 Local warlord Sigismondo Pandolfo Malatesta commissioned Leon Battista Alberti in approximately 1450 to redesign the Church of St. Francis in Rimini into a funerary shrine for him and his family. Alberti’s plans describe a elegant two-storied facade and a large round dome over the transept, but problems with money prevented the full design from being completed. I find the facade of Tempio Malatestiano really fascinating because at first glance it appears to be missing several elements. You can see in the picture below how the base of each arch connects to a capital. 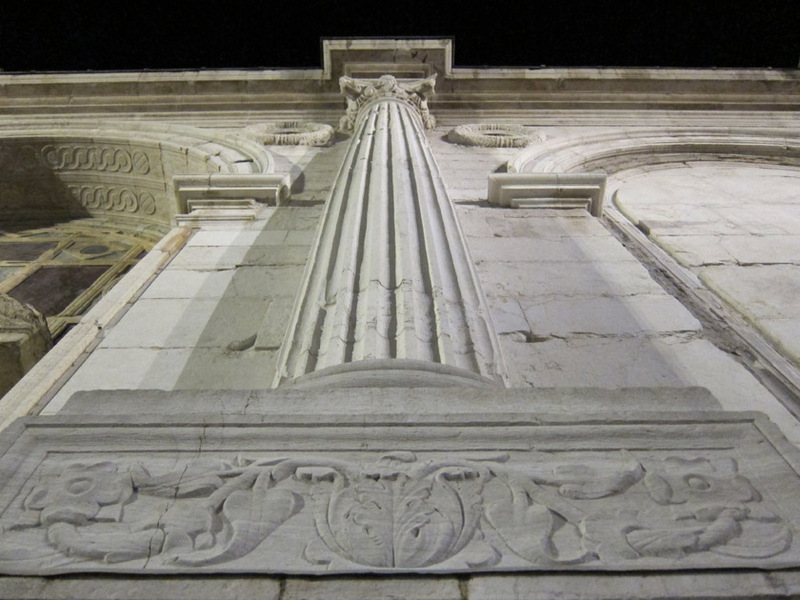 In most Renaissance designs, there should be a pilaster (or fake, decorative column) that connects from the capital of the arch to the ground, but there are no pilasters here. Since the hallowed out area inside the arch is so shallow, you get the impression of an architectural drawing without the weight of actually baring any building loads. Viewed from the side, the missing pilasters make a lot more sense. The side arches are much deeper and are linked more closely so that they appear to be standing on massive supportive pillars like a Roman aqueduct. This depth also defines the pillars so that decorative pilasters (or columns) are not needed in order to create unity in the design. It is unsurprising then that this was Alberti’s first religious architectural commission. While it is clear he understood the structural and design elements of classical architecture, he appears to have struggled with creating a purely decorative facade based on the elements he selected for the overall design. This “experimental” nature is part of what makes the Tempio Malatestiano such a unique and valuable building. Rimini is actually a very ancient city and it’s not hard to find remnants of this Roman past. The elegant Tiberius Bridge constructed of Istria stone dates to 21 C.E. and is approximately 63 meters long. Small breakwater “blades” jet out from the pillars to divert water more efficiently. I really liked the detail of small niches capped with pediments on each pillar – as if protective Gods once stood here keeping watch over the turbulent river. Amazingly the retreating German army tried to destroy this beautiful bridge in 1944 but were unsuccessful. 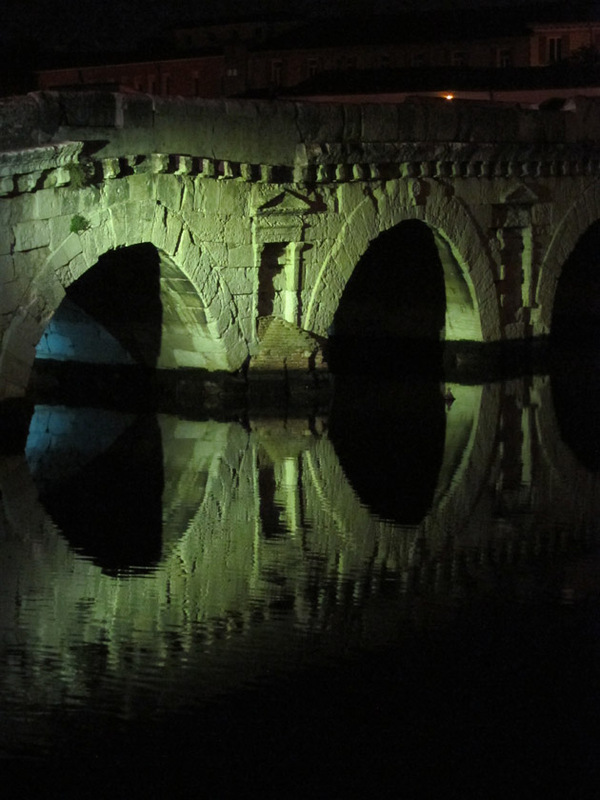 The 1st century Tiberius Bridge reflecting into the Marecchia River. 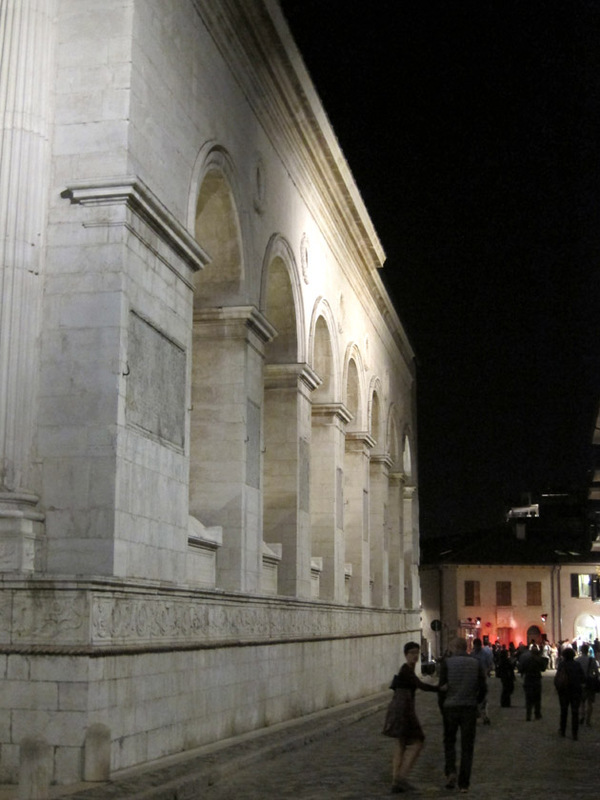 Once the ancient Roman forum, the Piazza Tre Martiri has a long history as Rimini’s commercial center. 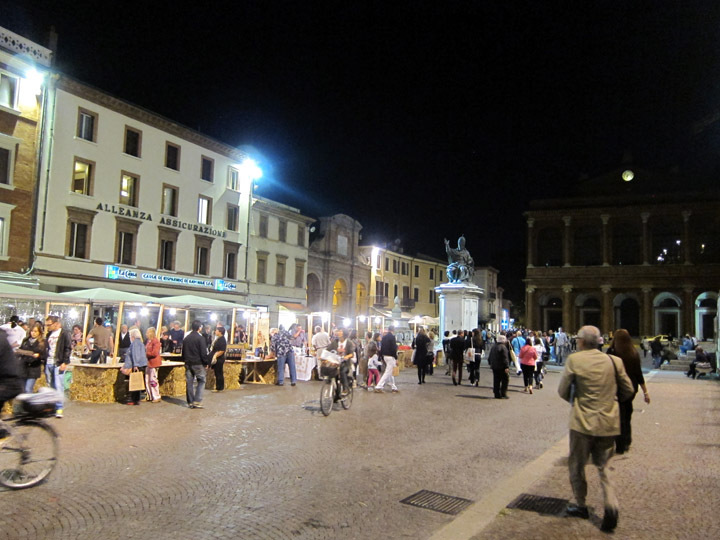 For centuries, the Piazza Grande (as it was originally known) was used for market days, festivals, and other events. 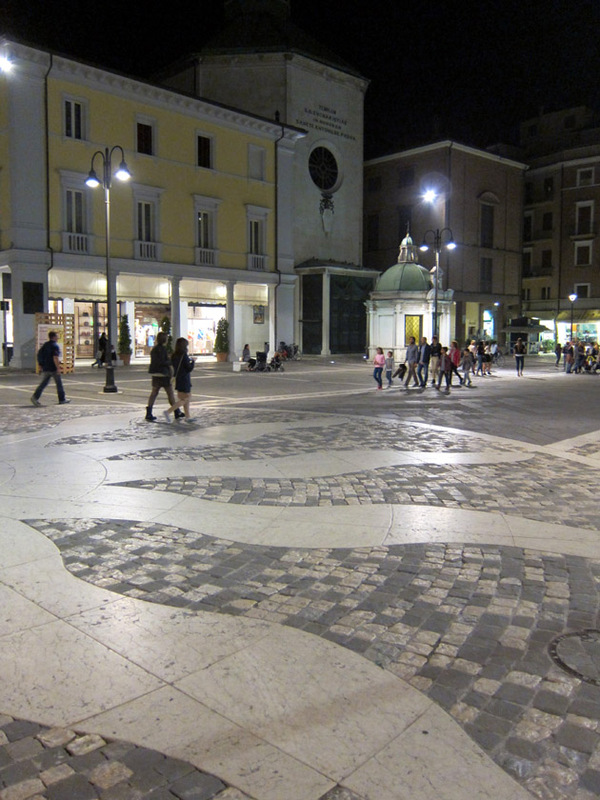 Even with the construction of new civic buildings in Piazza Cavour in the 13-14th centuries, this square remained the heart of Rimini’s social life. The modern name commemorates three resistance fighters that were executed here during World War II. From the Piazza Tre Martiri, you can see down the Corso di Augusto to the Arch of Augustus completed in 27 BC. The brick medieval-looking crenelations are definitely a later addition, but it is interesting to see the incorporation of an ancient monument into 10th century fortification. It was such a treat to find so much history and beautiful architecture in Rimini. The buzzing streets had a great energy as locals enjoyed the wonderful Fall evening which may for a pleasant (if not crowded) stroll. I wish I’d had more time to explore, but at least I got to see Rimini at my favorite time of day. Since I was selected as a Top Culture Blogger, my trip to Rimini was hosted by TBDI 2014 and TTG. My views on Rimini’s architecture and the most pleasant time of day are, as always, my own. Thanks! Yes we definitely need to spend some more time there next year!